This was a powerful look at a tumultuous time in history and the women and others who fought for rights for American labor. Readers used to toned down biographies and nonfiction will get a startling wake-up call as the story begins with the murder of the main character, Fannie Sellins. After the stunning opening, Farrell explains the history, context, and as much as is known about the life of Fannie Sellins. Little is known about her early life, marriage and widowhood, but eventually she went to work in a sweatshop, manufacturing clothing. With the other seamstresses they formed a Ladies' Local of the United Garment Workers of America and negotiated with the management to win better pay and shorter hours (although the dismal conditions of the sweatshops changed little). Sellins eventually came to work for the union full-time and began to travel, uniting workers, standing up for the rights of women and children, and garnering support for factory workers. Eventually, she came to the dangerous work of the coal mines of West Virginia. With workers in virtual slavery and government-backed mine owners, Fannie could have given up and gone back to her successes in the garment industry. However, she stayed and fought, supporting coal miners and their families. She was arrested, jailed, beaten, and eventually murdered. The sheriff's deputies who shot Fannie Sellins, despite numerous eyewitnesses, were never convicted. The book is filled with original documents and photos that show the grim conditions and the powerful organizations that Fannie Sellins faced. The author's note discusses more about the struggle for labor unions and whether or not Sellins made a difference. 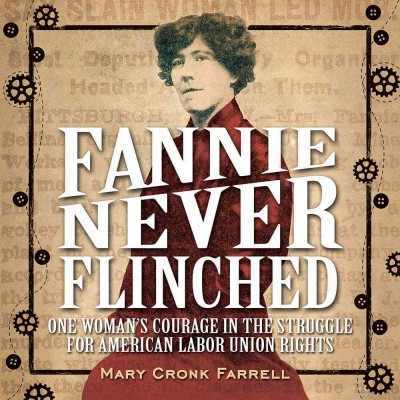 It also discusses her research and the gaps in the information about Fannie's life. Back matter includes an extensive glossary, time line of labor strikes and their results, notes and sources. There are also further resources for learning more about unions, acknowledgements, and an index. Verdict: Some reviewers recommend this for as young as fourth grade but for my audience it's going to land squarely in middle school up to teen, along with Farrell's other powerful work about women in history, Pure Grit. The story is dramatic but never exaggerates or is needlessly graphic. Readers may be shocked and horrified but will also be inspired to think about the changes they can make in their own families, communities and the world. Strongly recommended for teen nonfiction collections. I have mixed feelings about bibliotherapy. On the one hand, picture books on difficult topics can give parents a helping hand in dealing with said topics. On the other, I am personally skeptical of them really have an effect on the kids themselves. Be that as it may, I do get asked a lot for books on specific "issues" and this is the list I have so far. This is very brief and I still have many titles to add. This is NOT the same thing as our separate Parenting collection - all of these titles are intermixed with the regular picture books. I was at work for a few hours in the morning and then bravely set out for a conference. I will talk about it later - I'm covering all the backlog of professional development in November. It rained miserably all day. Jess went to the school b/c they couldn't walk over and took catapults to the youth center. A ton of people came and made super cute creations. I opened the Storyroom from 10-5 and had the leftovers from yesterday's program plus paint and some extra paper and stuff I dug out of the back. I worked on the Fairy Tale Adventure all day. I am really tired. Lexiles. This was one I couldn't help with - I just encouraged the parents to talk to the teacher and school librarian. Very high level lexile plus reluctant reader - sometimes you just can't win! I have mixed feelings about this title. Despite the less-than-stellar reviews, I requested it specifically because this year I have a population of very young kids with high reading levels (a three year old who reads chapter books, etc.). The Bobs are a family of slobs (all except for Bob Seven). They are kicked out for being so messy and noisy and quick-thinking real-estate agent Mo sells them a new house on Bonefish Street. At the same time, the Tweets, a family of obsessive cleaners, are looking for a new home as well. Except for Tweet Seven. She's untidy, lazy, and doesn't like to participate in all the organized activities of the Tweets. Once again, Mo sells a house on Bonefish Street. When the two families meet at the pool, a wild fight ensues! Will there every be a peaceful solution? Maybe. Sort of. 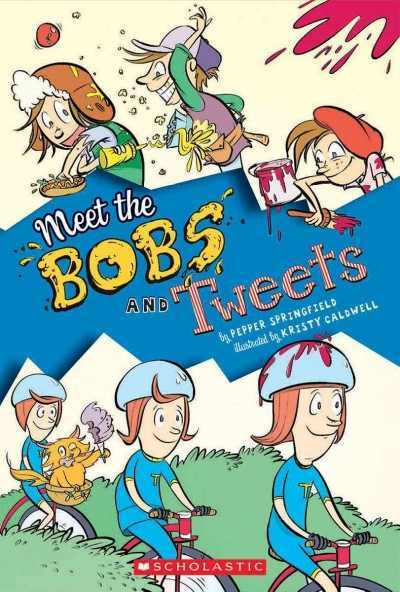 The Seuss-inspired art is colorful and cartoonish, showing the wacky and eccentric Blobs and the super-tidy Tweets. Silly details like Tweet Seven's Pretty Kitty and Bob Seven's carefully organized wardrobes point up their differences in their own families. The story is written in brisk rhyme that sometimes falters unsteadily or hits bumps. More troubling is the small type; for a book aimed at beginning chapter readers, the smaller, faint type will be the most difficult aspect of the book. There isn't a really strong plot here, or much of a plot at all. None of the characters have personalities beyond their outward appearance and the Seven's sudden friendship seems unrealistic. Sometimes the art doesn't completely match up with the text, as on the odd frowns on the Tweets' faces on the last page. 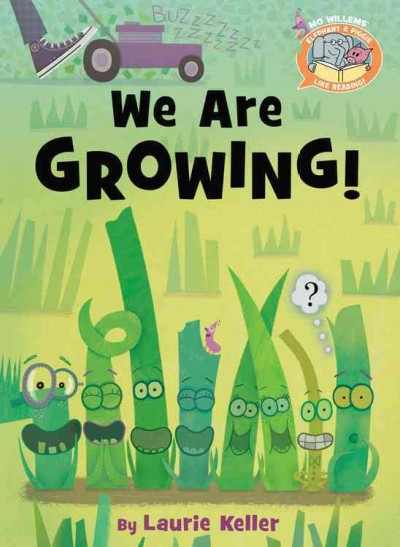 Verdict: While this isn't a first choice for beginning chapter books and is unlikely to appeal to older children, younger, strong readers may enjoy the light-hearted goofiness in this homage to Dr. Seuss. Johnson is back with another disgusting, fascinating, and completely engrossing book. Like Lunch fights back and Zombie Makers, this title explores a selection of unique animal abilities. In this case, camouflage and mimicry and the way animals use the art of deception to hunt, hide, and otherwise benefit themselves. 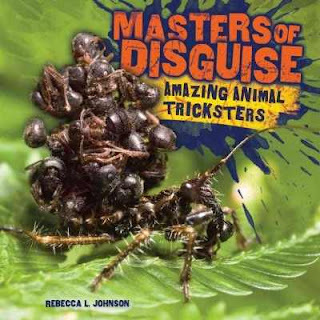 The featured animals include the assassin bug, pictured on the front cover, who disguises itself with a "coat of many corpses" and uses this disguise to catch its prey, ants. Then there's the chick of the cinereous mourner, which is disguised as a poisonous caterpillar or the caterpillar of the Alcon large blue butterfly which uses scent and song to trick ants into caring for it. Harlequin filefish disguise themselves as coral to confuse predators and the Cyclosa spider takes things even farther by creating a large decoy of itself to scare away predators. A gliding lizard looks enough like a leaf to distract predators for a few precious moments, the cuckoo finch tricks other birds into caring for its own eggs, and, most amazing of all, the Grote's tiger moth actually avoids bats by jamming their echolocation! Each chapter features a different animal and lasts 3-4 pages, with plenty of stunning photography. The animal and its ability is introduced in a short narrative and then there is a section titled "The science behind the story" which explains how scientists discover and research the animals' behavior. An afterword discusses instinct and genetics and how creatures learn the behavior described in the book. There is also a page dedicated to the scientists introduced in the book, source notes, glossary, bibliography, and further research and reading. I love the way the author combines "isn't this gross/amazing/weird" with science, especially where the scientists talk about how they're still studying to learn how/why the creatures do what they do. It's written in a fresh, engaging way that doesn't over-dramatize the freaky parts and also keeps the science brisk and readable. 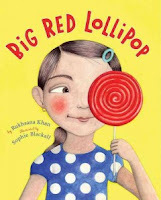 Verdict: This book will grab readers' attention from the first sentence and keep them absorbed until the end. Definitely worth the slightly higher price of Millbrook's titles - highly recommended. Oh, this was very, very clever! The first page shows a set of apparently random dots and lines and a question. The facing page has a die-cut shape. Turn the page and the die cut shape, random dots and lines, all combine to create new animals! The smiling face on the cover becomes the muzzle of a monkey. A straight line and dot on one side and a smiling green oval become, respectively, a fish and a frog. 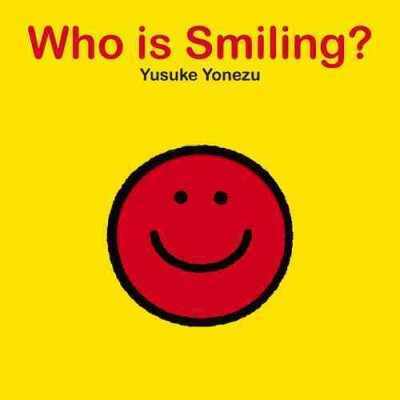 The book continues through various animals and ends with a smiling baby. While most of the clues are far too abstract for a toddler or even preschooler to guess, once they've read the book a few times they'll have a better idea of what to look for. Babies will also enjoy the sensory experience of the die cut shapes. The book is a sturdy square with glossy pages that will be easy to clean. The die cut shapes are situated firmly in the center of each page and, other than the front cover, are not large enough to weaken the structural integrity of the book. Verdict: Sturdy, clever, and child-friendly this is a board book that children and adults will enjoy reading over and over again. 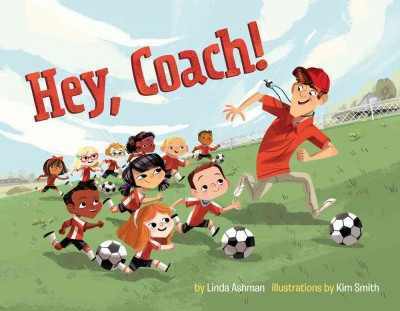 Cheerful rhymes present a diverse group of small children, both genders and multiple races present, and their coach. After deciding on a name, The Sparks, the kids are ready to learn! Anyone who's ever tried to organize a large group of small children will be laughing hysterically as they recognize the chaos that ensues. Running the wrong way, forgetting what to do, stopping to check their clothes, important bathroom (and snack) breaks, all the fun of sports are here. Although I'm not a sports fan myself, many kids of all ages are and of course I need to cover their interests in our collection! 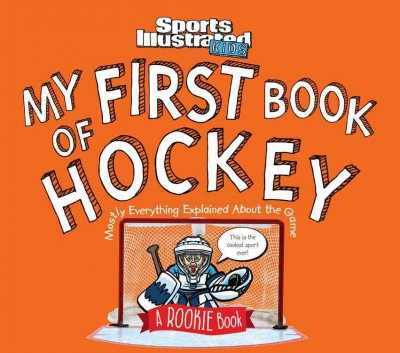 It's hard to find sports books for very young fans, even though rookie sports are super popular in our town and presumably elsewhere. I liked that the coach and umpire (a dark-skinned girl) both appeared to be teens - many of our local sports teams are at least partially run by enthusiastic teens and it's great to see how involved they get with the small kids. I strongly appreciated seeing the involvement of girls, often left out in sports books, and the emphasis on the kids learning and having fun, not necessarily winning. Verdict: If, like me, you are trying to build a sports collection for your youngest readers (and players) this is a must-have. 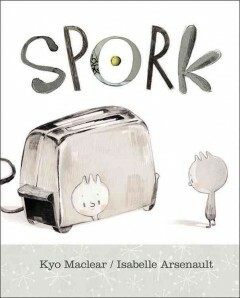 Both parents and children will enjoy this cheerful story of participation. Ah, now this is a sport that makes sense. Only a few players, a simple goal, you whack each other in the wrong place you get into trouble. What could be simpler? I'm not a sports fan. Clearly. However, even I enjoy these simple explanations of popular sports, along with cartoons and jokes. Photographs of two teams, along with a cartoon player, walk the reader through the basics of hockey. The page backgrounds are brilliant colors and the book is divided into periods, instead of chapters. Although there isn't a source or bibliography, this is so simple that there really isn't much need for one. There is a small ad for Sports Illustrated Kids magazine in the back. Verdict: It's difficult to find books on sports for the very youngest of kids, and yet both they and their parents are often interested in this subject. This is a great series for little players and highly recommended, although I do hope the series will continue with women's teams at a later date. I am so excited that Cybils has added a board book sub-category this year! Board books, along with easy readers and nonfiction, are one of my prime book interests. This also coincides with the jump in my library's board book circulation. After many years of averaging 300-400 a month, we dropped below 300 and it took a lot of hard work by myself and my staff over the summer and fall to get us back over that 300 number. I've created a spreadsheet of all the nominations which basically includes my reviews, diversity if any, and links to my reviews. You can access it here. Sometimes I keep track of all sorts of things for Cybils fiction picture books, when I'm on the judging panel. I decided to classify the books by diversity and where I would put them in my library neighborhoods. I've also linked all of my reviews, both brief and in-depth. You can see the spreadsheet here. As organizer of the Elementary/Juvenile Nonfiction Cybils category, I moderate but do not directly participate in discussions and judging. However, in order to make sure titles are placed appropriately and to moderate discussions, I have to know what we're talking about! If you ever wondered what goes into being an organizer - I've shared one of my spreadsheets below. This helps me keep track of nominations, put them in the appropriate category, and the linked reviews let me go back and see what panelists are discussing. Yes, I have other spreadsheets. Yes, I may have a little problem. Ok, maybe a big problem. Whatever. You can access the spreadsheet here. Note that there are two pages - one for elementary and one for juvenile. Maybe I shouldn't write these titles before the week begins. Calm? What calm? It was a crazy week! I took the day off to finish some work at home - writing, reviewing, and some other projects. Like making a giraffe. Very busy day. Catching up on all the things that accumulated over the weekend and my Monday off. Some days all you can say is that nobody died (yes, the teens have been biking through the parking lot again. We have discussed this people!). I tried to get things done around my program etc. but it was just too busy. We were closed for our staff work day. We had an all-staff meeting - we can only do this a couple times a year and even now not everyone can come, like my teen aides. We had some training for those who wanted/needed it on using the staff side of the catalog. Then we all worked on projects. Some major moving projects for the adult department, city guys came to help out with moving shelves, I worked on various projects and the basement. Went home a little before 4. I'll do pictures later of the rearrangement of the teen area. I made a short Utube video of our Lego Building Club over the years. Very short. high level reader who doesn't like "bad guys". Recommended Henry Reed, Farley Mowat, and Paddington. Parent also took Clementine. 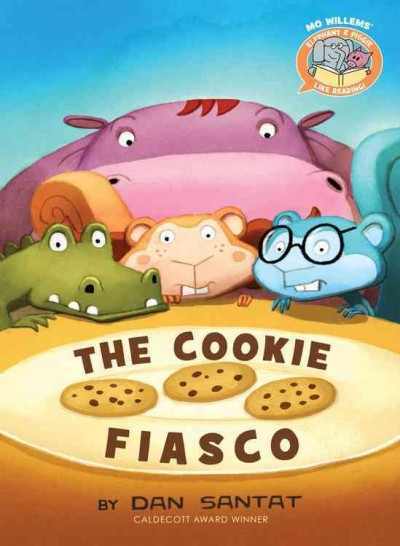 I am so excited about this new series; it's a nonfiction, beginning chapter book which is perfect for my Magic Tree House fans and for my book clubs! 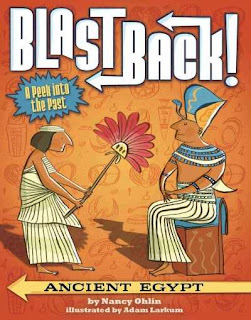 After a brief introduction, the book walks readers through the basic geography, religion, culture, and history of Ancient Egypt. It packs a lot of information into a little over 100 pages, including daily life, famous rulers, important events, and some natural history. The last few chapters talk about the end of the Ancient Egyptian civilization as it was conquered by the Romans and how archaeologists learn about the past, including the Rosetta Stone. It finishes with some of the legacy of Ancient Egypt. The book includes a list of future topics for the series, a simple bibliography and biographies of the creators. Larkum's line drawings add the perfect note of humor, while not caricaturing the customs or people. They have a classic cartoon feel and break the text up just enough. I was rather disappointed with Little Bee's Hideous History series, but this is just right. It's the perfect length and interest level for beginning readers, includes a reasonable amount of information without being too graphic or one-sided, includes sources, and is both fun and informative. It's also available in both hardcover and paperback. Verdict: I will buy them all! You should buy them all too! I can't wait to use them in book club. The only question in my mind now is where to put them - with our paperback beginning chapter series or in the juvenile nonfiction? I write this on a cold evening in March when my internet has mysteriously died again, sigh, and I am on a review splurge. So. Claire Boucher loves to ice skate. 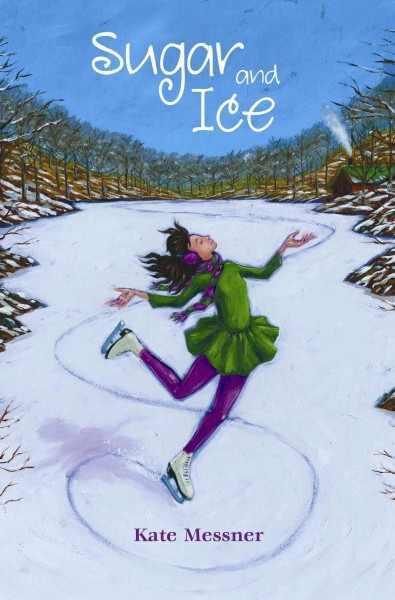 She skates on the pond by her family’s maple farm, she teaches smaller children in their skating club, and she’s been working for months on a solo routine for the Maple Show with her warm and beloved coach. She loves their maple farm, her best friend Natalie who is a keeps bees, and math. Then Groshev, a famous skating coach, shows up at the Maple Show and offers her a scholarship to train at Lake Placid. Claire isn’t sure how she feels about this. Her older cousin, Charlotte, is in training to be a professional skater and she knows it’s hard. She’s not sure she wants to give up so much. But everyone thinks it’s the opportunity of a lifetime, everyone is making sacrifices so she can go, so…she does. She finds out it’s harder – and more painful - than she had expected. She barely has time for her schoolwork, let alone her friends and her family. Groshev isn’t warm and understanding like her old coach, and the competition is fierce. Worst of all, some of the other girls will do anything to discourage her, from mean whispers to vandalism. Is it worth it? Does Claire really want to be a professional ice skater? If she does, does she have what it takes? Messner does an excellent job not only portraying the competition, ambition, and squabbles in an extremely competitive sport but also the real characters of the people involved. She doesn’t sugarcoat the emotional and physical hardships that accompany this competitive sport, but she also writes enthusiastically and beautifully about the people who enjoy it and the beauty of figure skating. Claire is a wonderful character, realistically excited and nervous about trying something new and difficult, confused and hurt as she tries to fit into another world, and finally triumphant as she stands up for herself and makes her own decisions. There is a little bit of innocent romance as she makes friends with a boy in her skating group, but the main focus of the story is on Claire and her trials and triumphs. Elephant and Piggie are gone but not forgotten. Mo Willems has started a new imprint, with stories introduced and epilogued by the duo, featuring a variety of fun, well-known authors and illustrators. 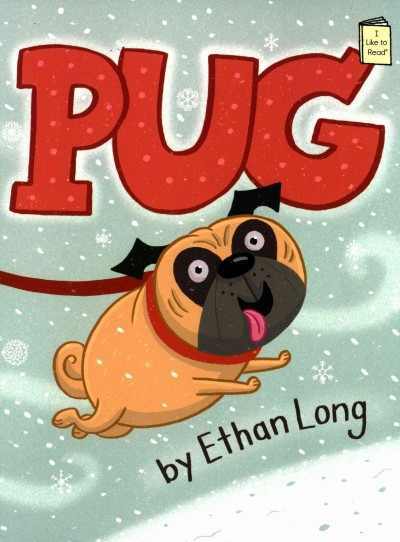 One of the first two books is written by Dan Santat, creator of Beekle and other favorites. Hippo, Croc, and the squirrel siblings have a plate of delicious cookies. But there are only three! Someone will not get a cookie! Or will they? Fractions and hilarity ensue. Santat's style is colorful with sharp lines and edges but also tends toward the crowded and close-ups. I felt like a lot of the story was shouting in my face and the rapid jumps from capitals to smaller fonts was disconcerting. Also, for readers trying to practice fluency and comprehension, expecting them to pick up on the mathematical concepts is too much. Verdict: Will kids love this? Absolutely. Should you buy it? Definitely. It's not necessarily what I'd promote as a great easy reader per say though. It will be a better choice as a read-together or for more advanced readers. This book took me back to many beloved British fantasy classics as soon as I saw its Victorian setting and black and white drawings. The magical journey begins on an old-fashioned steam train as two children embark on an imaginative journey to a mysterious city where animals mingle with people and strange buildings tower over the crowds. 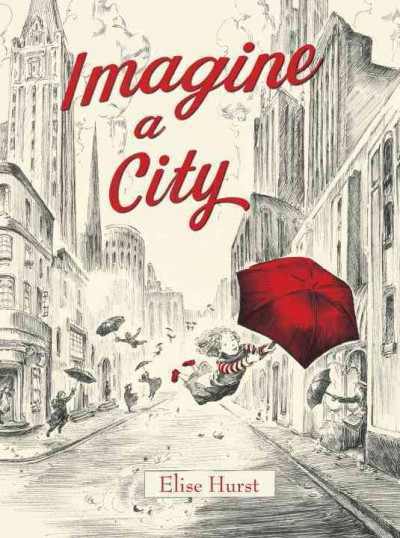 The wind catches umbrellas, swooping the people and animals on the streets off to the next adventure and they fly through the sky on a floating fish, visit a library where the books come alive, and explore all the wonders of the imaginary world. The story ends with the marvelous world held in a globe and the children fast asleep on the train. I loved the art but felt that it could easily have stood alone without the accompanying text. The words didn't add anything to the plot or the experience of the book itself and were a distraction from delving into the pictures. I don't generally care for rhyming picture books and thought the words were superfluous at best and saccharine at worst, "The past carries on/and sunlight is breathed in a murmuring song" accompanies pictures of a vaulted hall with giant sculptures, skeletons, flying fish and pterodactyls, and a mix of people from a lady wearing a kimono to a fox reading a brochure. Verdict: Use this as a wordless book to inspire imagination in older children or for quiet readers to pore over on their own. An additional purchase, but one that will resonate with a number of readers. National Geographic rules in the genre of what I like to call "factoids"; collections of fun facts. 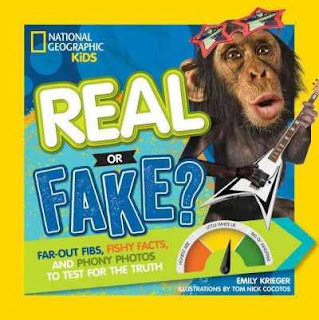 This book challenges kids to analyze photos and "facts" and figure out which are real and which are fake. The introduction gives three criteria for deciding what is true and what isn't; check the details, compare the story to your own experience, and be skeptical of things that sounds too good to be true. The stories range from fake new stories (there will be six days of total darkness this December!) to gags that people took seriously, like the BBC's documentary about spaghetti trees. There's also wacky true tales, like the battle over guano-covered islands in the Pacific or elephants' ability to communicate long-distance through seismic signals. Interspersed with these longer (four page) stories are quick quizzes of facts and photos. Some are odd jobs (Hotel Bed Warmer is an actual job) or multiple choice quizzes - mosquitoes, not sharks, are the deadliest animals on earth, etc. The photos include obviously photoshopped images as well as tricky perceptions and wacky poses. The book is illustrated with a combination of photos, collages of images, and lots of splashy color and layouts. Verdict: While kids will certainly enjoy skimming through this, I didn't feel that the brief introduction offered enough information on how to evaluate the information. So, I wouldn't use this for teaching information evaluation skills, but just for fun! The day started. I was happy and upbeat. Then the printer happened. Now I hate everything. Now the laminator hates me. WHY. Kindergarten Field Trip: We are in a book! 60 kindergarteners came and had a blast, narrowly avoiding rain at the beginning and end. It was very busy and crazy. My feet hurt. Some great takeaways from the teen presentation by Emily Ellis and of course as always we enjoyed our colleague Abby Bussen's spirited presentation. She rocks! Back to working on toys again. Updating, cleaning, repacking and more. Ugh lexiles. Talked the parent into taking Summer I saved the world anyways as well as Notebook of Doom. movie recommendations - found someone to appreciate wind in the willows! I purchased this for the library of course. Squish isn't quite as popular as Babymouse, but mostly because not all the kids have realized there's another series. I probably should have shelved Squish with Babymouse. 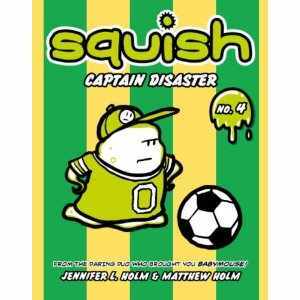 Squish tackles the world of sports in this title, joining a soccer team, the Water Fleas, and dealing with constant losing. He's thinking of himself as Captain Disaster, when he figures out how to play to his players' strengths and they start winning. However, his friends, dad, and coach all insist that he's being mean by not allowing everyone a chance to play and have fun and that's what sports is all about (never mind the other teams who made fun of them when they lost). Squish lets his other friends play and they lose, but everyone has fun. I don't remember the other Squish stories having quite as much sarcastic snark, but it's been a while since I read one and I don't think most kids would notice it anyways. I didn't care much for the message of this one myself, but mediocrity seems to be the goal in education now and a lot of parents and teachers will like this. The kids just like the weird amoebas. Verdict: If you're buying Squish, and of course you are, buy it. Library bound. Feel free to roll your eyes in private if you, like me, are not an advocate of teaching children that hurty feelings are the most important things in the world. ISBN: 9780375843921; Published 2012 by Random House; Review copy provided by publisher (added to summer reading prizes); Purchased for the library. Petra's father, a skilled inventor, is honored to be commissioned by the prince to create a wondrous clock. However, when the prince has the inventor's eyes removed it's up to Petra and her talking tin spider Astrophil to not only retrieve her father's eyes but stop the dangerous clock. Why did it take me so long to read this book? It was a perfect blend of history and magic, marvels and discoveries. Petra was an intriguing mix of innocence and determination and her friends and enemies were a fascinating collection of characters. The mix of adventure, history, and magic is excellent. It's not quite a steampunk title, although it has elements of steampunk in the many metal inventions. It's not quite historical fiction, although it includes many legends and mentions of historical characters of Bohemia. It's not quite fantasy, but there's definitely magic involved. I've been looking for a book to start off the 5th/6th grade book club I'm planning for the fall and I think this will be it! I've already got ideas for making our own marvelous marbles, dyed cloth, and more! ETA: Sadly, no one came to book club. Sniff. 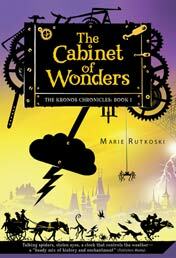 However, this book has checked out steadily, although it's not a hugely popular volume it's intriguing and there are plenty of kids who are attracted by the mix of steampunk, history, and magic not to mention the gorgeous cover! Elephant and Piggie are gone but not forgotten; their legacy continues in a new imprint, Elephant and Piggie Like Reading! This is one of the first two titles to debut in the series. Laurie Keller, author of such oddball favorites as Arnie the Doughnut and The Scrambled States of America, does not disappoint in bringing her trademark humor to this comic-style easy reader. Eight blades of grass are all the same until they start growing. Soon they begin to have different shapes - the tallest, the crunchiest, the dandiest - but what is Walt? While they're trying to decide, BUZZZ along comes the lawnmower. Now nobody is the -est at anything anymore. Or are they? The story is bookended by Elephant and Piggie introducing an exciting new story and then commenting that it is the "funniest". Keller's art focuses on the eight grass blades. Although it lacks the white background of Willems' work, the soft shades of green and faint shadows work admirably and the contrasting colors of the speech bubbles are an excellent choice for beginning readers. 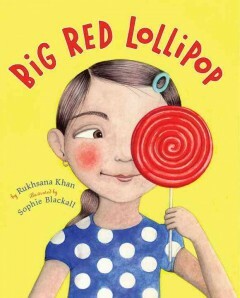 Verdict: A great first entry in a new series, sure to charm children and grown-ups alike. Nick does everything with his cats, Verne and Stevenson, except read. The cats are really not into the whole reading thing. Nick just can't fathom not sharing one of his favorite activities with his best buds, so he decides to teach them to read. At first, it doesn't go so well, but then Verne gets interested. But not Stevenson. No matter how much fun Verne and Nick have reading together, Stevenson remains obdurate. But then they discover that it just takes a little searching to find the right book - and Stevenson becomes a reader. The rest of the summer is an exciting journey through books as Nick reads and adventures with his favorite friends. 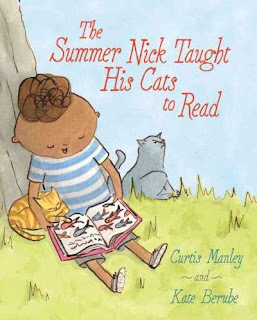 Berube is a bright new talent in the picture book world and her watercolors are just perfect, showing the cats' opinion of being taught to read, from grumpy face to snarly whiskers, as well as Nick, a cheerful boy with a swirl of curls and an imagination that just doesn't stop. While I'm usually not a fan of library or book-themed books - I feel like it's preaching to the choir and a bit self-indulgent - I can really get behind this one. It has a strong, humorous plot besides the "love reading" message and even sneaks in a subtle hint; Stevenson gets into reading after drawing and being allowed to choose his own books. Verdict: A perfect summer read. Highly recommended. I finally got my hands on a copy of this unique new nonfiction title. It's a concept book, an animal book, a fact book - it's just fun! It's also, hopefully, the beginning of a new nonfiction series - The World of Weird Animals. Keating, author of quirky middle grade novels like How to outrun a crocodile when your shoes are untied, uses her zoology background to introduce readers to pink like they've never seen it before. 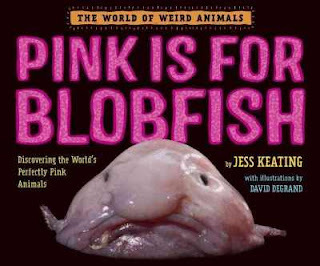 From blobfish to pink fairy armadillos to pink land iguanas, pink is everywhere in the natural world. But there's more to these animals than just their color. Interesting history and quirky facts are included as well as basic stats about each animal. So, for the spread featuring roseate spoonbills we not only get a lovely photograph of this stunning bird, we also see some silly cartoons, learn what makes their feathers pink, and their history of near extinction and conservation. There's also a column of facts from their species name, size and physical description, to habitat and predators and threats. Back matter includes a map showing pink animals around the world, a glossary, and further information. Verdict: This is a great gateway title to get kids who are past the typical "animal fact" fare but not ready for more challenging series like Scientists in the Field engaged in nonfiction. I'm looking forward to more titles in the series. Highly recommended. I started my list of Cybils nominations even earlier this year, hoping to inspire everyone to get some great nominations in this year. You can tell what I read most of... So, go forth and nominate! I also keep records of all the materials I purchase for my library on Pinterest here, which can be handy to look at. Oy. What a day. I still have a cough from my sinus infection, which is annoying. Sick staff, schedule changes, staff meeting, phone calls, emails, working on reports, packing outreach baskets, and on and on. I am thankful to the fate which determined this would be the one time I have my phone by my bed (something I normally never do) and so was able to come in and meet the 1st graders! Two very sweet classes - especially loved the kids who helpfully translated their classmate's remarks for me, when I couldn't understand him. We read Eat Like a Bear and talked about omnivores and what bears do to get ready for winter, Round Robin and talked about birds flying south and Tap the Magic Tree and talked about how leaves change (which I may have made up - I should check that) and how important bees are. Phew! I'm also grateful for our awesome reading dog and her mom, who can handle things without me! Pattie made glittery pumpkins with the toddlers and they were many happy faces meandering around the library. Happy babies always makes the morning more cheerful. I worked on this week's programs, av orders, and some possible grant stuff. We had a very loud and enthusiastic book club. We were so chatty we barely had time to pick our next books! Making our own escape plans a la The Great Pet Escape was a favorite activity. Some of us wanted to talk about Rosa Parks, but things were a bit too loud and raucous for serious conversation at that point. Some important things I couldn't leave until later so I finally left well after six. I'm tired. Jess covered the 2nd grade community walks while I did outreach storytimes in the morning and afternoon. Then I worked again on reports, then I went out to the youth center. Although the kids had really, really wanted clay again they were more meh this time. Still, about 10 participated. They are very worried about Killer Clowns (and Trump). Then I finally finished my reports. Sara the Librarian came to my rescue with leaves! Most of the morning was taken up with the latest news: Trump is definitely coming to town this Saturday (the middle schoolers were correct on this one, but I am not taking their word for the killer clowns). The fair grounds are up the street from the library so we need to be prepared. At Messy Art Club I had a huge group at the beginning and then suddenly everyone left! But many leaves were used. Phew. I love all my four year old and five year old kindergarteners but that was a marathon, especially since I still have a miserable cough. I did three back to back morning storytimes at once school, raced across town to do another, then back to the library to grab some lunch and then an afternoon storytime. I spent the afternoon working on scheduling staff and programs for the next couple months. I have some shopping for work to do this weekend, but other than that the week is over! Updating schedules through December. This was very complicated and involved Math. books about solar energy for younger kids (teacher request) - gap in collection. fall, apples, pumpkins. will I ever have enough? This is a new (to me at least) beginning chapter series that was completely off my radar until the publisher sent me some review copies. It's a pretty typical beginning chapter series - some nondescript kids, simple mysteries, and a quirk that defines the series. The quirk for this series is that all the mysteries are set in famous ballparks. Cousins Mike and Kate are the detectives and Kate's mom is a sports reporter, which provides the backstory for them having access to so many famous ballparks. 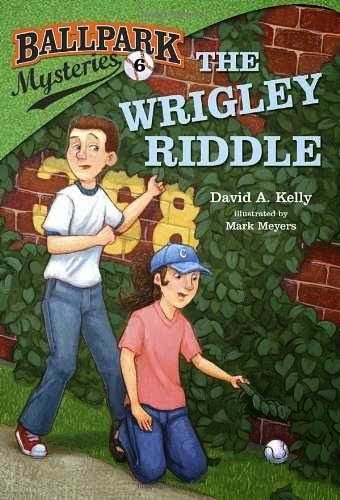 In this particular mystery, someone is cutting the historic ivy in Wrigley Field and the kids have to decide who's a suspect, look for clues, and set a trap to catch the culprit. Along the way there's lots of history about the ballpark and the teams who have played there as well as the fans. The "Dugout Notes" at the back add even more details and context for the various events and traditions referenced in the book. Verdict: This is a nice idea - mysteries with a baseball theme - and while there's nothing outstanding about it, it's a perfectly serviceable series. It's a nice touch to make the mom a sports reporter; I have a lot of girls ask for sports books and this does a good job of having a female detective and showing a nice balance of male and female fans. If you have space for another beginning chapter mystery series, this is a good choice. ISBN: 9780307977762; Published 2013 by Stepping Stone/Random House; Review copy provided by the publisher; Donated to the library and the rest of the volumes in the series purchased. Max is nervous about spending his weekends with Dad, now that his parents are divorced. It seems like his dad doesn't know him well at all - he's not into football anymore! The apartment is bare and lonely too. Fortunately, both Dad and Max are willing to compromise and talk things out. Each weekend they have a new adventure, from being spies to taking out a neighbor's dog, to a school emergency. Finally, Max feels at home in both his homes - his house and his apartment. Black and white illustrations dot the story, showing quirky Max, his nerdy Dad, and their gentle adventures. I am very much torn about this book. On the one hand, there are very few titles for younger readers that portray divorce. This is matter-of-fact, without angst, and shows Max dealing with changes in his family in a gentle, friendly way. It also portrays a fun sense of imagination and exploring the city. On the other hand, Max feels very young for a third grader. I have a hard time seeing any third graders I know wanting to go out and play through a complicated spy scenario to the extent of dressing up. There's also little to no mention of electronics, a big part of life for most kids this age. At 150 pages, it's too long for the younger audience and the general tone of the characters and "adventures" is too young for kids who could handle that length. Finally, the whole divorce scenario just didn't match with the real-life experience of most kids in my community. I generally see parents racing around to get kids to all their scheduled activities, handle a complicated schedule of handing the kids back and forth, and basically just getting on with life. The slow, relaxed pace of the story just dragged after a while. 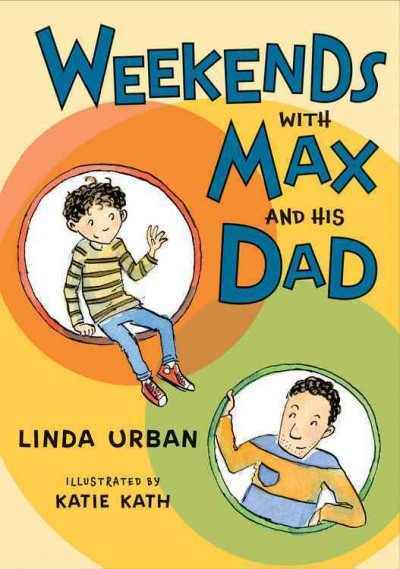 Max's dad's ignorance about his changing tastes was odd - was he absent from Max's life for a long time? Why is he such a stranger to Max? For a dad who is planning to be this involved in his child's life, his uncertainty doesn't ring true. Verdict: While this will be perfect for some communities - I'm thinking higher income, urban scenarios - it doesn't fit my community. The childishness of the characters and length of the book make it difficult to find an audience as well. I have to admit that, in general, I do not share the public's adoration of pugs. I am really not a fan of small dogs in general. However, I am a fan of Ethan Long and he rocks the easy reader format in this entry in Holiday House's I Like to Read series. Pug looks out the window and sees his friend Peg going on a walk, in the snow. He tries to coax each member of the family into taking him out but to no avail until he threatens Tad with a leg lift. But is he too late? Will he find Peg? Long's cartoon art has been compared to Mo Willems but he has a style that is very much his own, Sleek, clean lines blend with solid blocks of color to create pictures that are funny without too many intricate details distracting from the text. 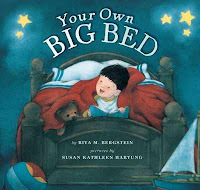 The text itself is one of the rare titles that is truly an emergent reader with simple, repeating words and phrases. The only drawback is the format of the book, which for this series is in picture book size, and the lighter color of the font - I prefer a darker, more contrasting font myself. Verdict: Although I have some issues with this series, this book is almost perfect and I strongly recommend adding it to your easy reader sections. 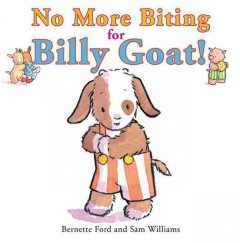 I usually request multiple titles from this series for use in early literacy classes and this one is definitely going on the list. 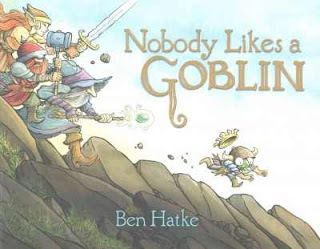 There aren't a lot of truly magical, as in fantasy, picture books out there but Ben Hatke seems to have caught the knack. Fun for younger kids, full of sly humor for older kids, and even more subtle jokes for the adults. Nobody likes a goblin. But he has his friends, like Skeleton, and plenty to do in the caves. But what's a goblin to do when his best friend gets stolen? A determined goblin puts on a crown and marches out into the sunlit world to find his friend. Verdict: A unique and delightful story, perfect to fill gaps in your collection and enjoyable for all ages. I have mixed feelings about this new teen nonfiction title. I read it as my lunch nonfiction and, while it grabbed me and I devoured the whole thing in a few days, I am uncertain about its teen appeal. 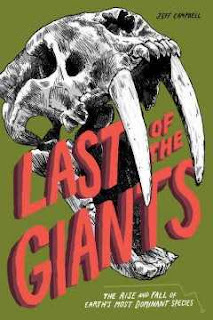 So, this is a look at evolution, history, and the effect humans have had on the environment as seen through the extinction (and endangerment) of mega-fauna. Each chapter addresses the rise - and fall - of a once-dominant species. These include the moa, aurochs, elephant bird, Steller's sea cow, Indian Ocean giant tortoises, passenger pigeon, California grizzly, Thylacine, lions, red wolf, tigers, baiji, and rhinoceroses. Each chapter discusses the effect these creatures had on their environment and the causes and contributing factors in their extinction or endangerment. The conclusion discusses the sixth extinction and anthropocene, which we are now living in, and talks about changes that humans can make. I personally found this fascinating. It's packed with history, science, and a dry humor that I appreciated. Campbell draws a clear line between fact and speculation and offers practical advice and talking points for further discussion and action. But....will teens pick this up? I'm not sure. It does have an eye-catching cover, but the text is dense and will require a decent reader to work their way through it. My teen nonfiction collection is primarily browsing materials and heavy on the misery memoirs, minecraft, and diy books so this is a bit of an odd choice. Verdict: You'll have to decide for yourself if this is right for your library. Since I'm currently interested in diversifying my teen nonfiction and, having enjoyed the book myself, am confident of booktalking it to readers interested in science and history I am happy to have added it to the collection. Vacation! I was off Monday - Thursday and came in on Friday and Saturday. 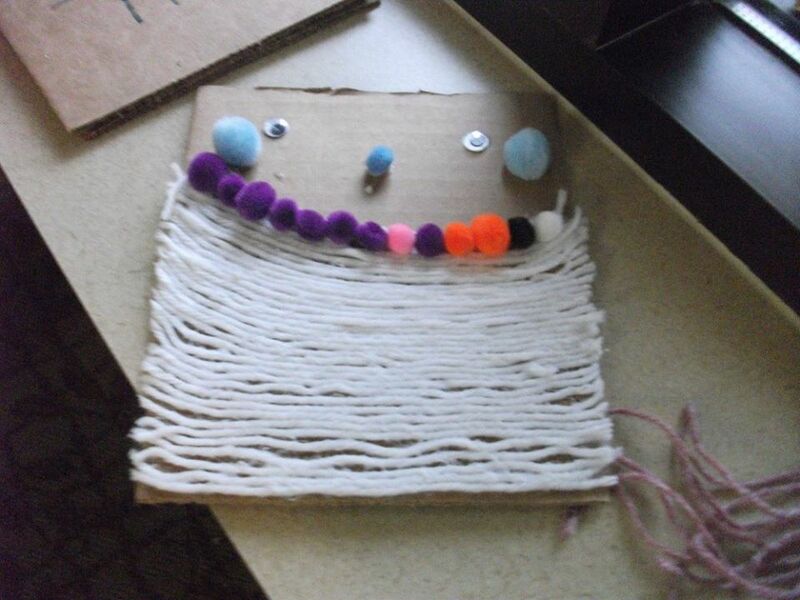 I had Craft-o-Rama on Friday, which is basically the Storyroom open with crafts all day long, 10-5pm. On Saturday, I worked the information desk and Pattie ran "It's Great to be Three" a program for three year olds. During vacation I reviewed books, cleaned my apartment, gardened, had a sinus infection, put together a new chair (old one broke), worked on Cybils, went out to eat with Sara the Librarian, cataloged my trashy romance ebooks, worked on the brick walls around my garden, read books, did paperwork, cleaned the kitchen, and went on walks. I felt miserable for most of it, but at least I was productive, even though I didn't feel particularly productive. In the day and a half back at work and in between desk shifts, I tackled updating the outreach plans (needed for next week), cleaned off my desk, wrote reports and processed statistics, started prep for book club on Tuesday, updated outreach schedules, answered emails, refilled displays, tackled more of the toys waiting to be updated, worked on Facebook posts, and worked on planning the fairy tale adventure. I'm not sure if I'm rested or not.